Hanoi can be an overwhelming city to visit with its crowded streets and frantic traffic. 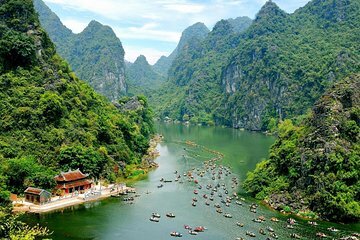 Get away to a slower, calmer part of Vietnam for two days with this two-day tour of the Ninh Bình province just under 60 miles south. Spend the night in a beautiful location full of natural highlights to get lost in. Take a sampan or bicycle around Tam Cốc (Three Caves) and visit one of Vietnam’s largest pagodas, the picturesque Bai Dinh Pagoda.